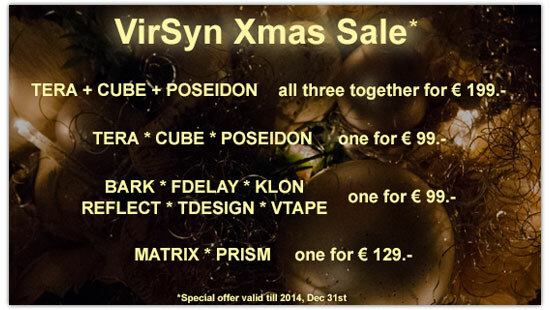 Our Xmas Sale is online ! All three instruments together for only 199.- Euro instead of 507.- Euro ! The VirSyn Team wish you a peaceful time! Unsere Weihnachtsangebote sind online ! Alle drei Instrumente zusammen für nur 199.- Euro ! Das VirSyn Team wünscht Ihnen eine schöne Weihnachtszeit! VirSyn Software Synthesizer - Bruchsaler Weg 4, 76327 Pfinztal / Germany. ...i use a ton of vocoders in my bands and iVoxel will really allow me to experiment and come up with new crazy ways to incorporate robot voices into our music.